The film illustrates final traces of: Hans Hofmann, Peggy Guggenheim, Jackson Pollock, Clyfford Still, Willem de Kooning, Arshile Gorky, Adolph Gottlieb, Franz Kline, Ruth Kligman, Barnett Newman, Ad Reinhardt, Mark Rothko and furthermore their meeting points like Cedar Bar or The Club. The film shows exactly the sidewalks, where deKooning walked around nearly every day in the 1940s in NYC: his studio at 22nd Street/7th Avenue and 6th Avenue/8th Street from Walddorf Cafeteria to the Artists Club and the Cedar Street Tavern. Streets were an important inspiration source for Willem deKooning and his work. This is explained in a lof of interviews and personal statements. 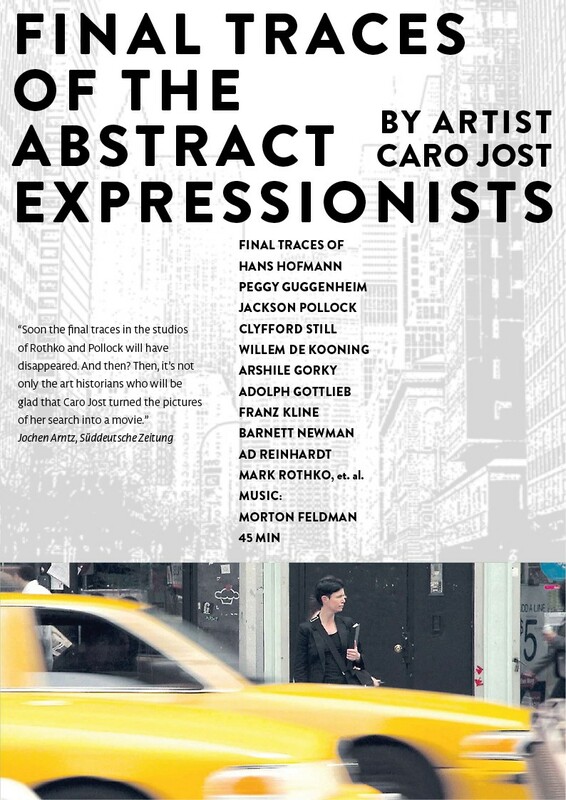 Caro Jost follows into the footsteps of Willem deKooning in 2011. Soundtrack recorded during the exhibition “Abstract Expressionist New York”, MoMA, April 2011 infront of Willem deKoonings paintings. Street noise recorded at 8th Street, New York, 2011. The film is tagged with cites by Edwin Denby, Dore Ashton, Philip Pavia – close friends of deKooning. All copyrights for the articles, texts and shown photographs are held by Caro Jost or the writers. Neither text, articles nor images may be reproduced in any form without the permission. You may not modify or further reproduce the content for any purpose whatsoever. You must request and obtain permission for all uses of content. The information on this Site is for informational purposes only. Caro Jost is not responsible for any errors or omissions in the Site or Site Materials. Caro Jost is not responsible for and do not guarantee the accuracy or completeness of any User Material, Site Material, links, advertisements or other items contained within the Site.